This one is very easy to make, and is easy to make ahead, which is good for families. I use brown rice, so I let it cook a while longer so that it would be done (about an hour). Heat Dutch oven over medium-high heat, steam-cook eggplant and next 8 ingredients (eggplant through red pepper); sauté 1 minute, or until soft. Add rice; sauté 3 minutes. Stir in tomatoes and broth; bring to boil. Add chickpeas; stir well. Spoon rice mixture into a 13 x 9-inch baking dish. 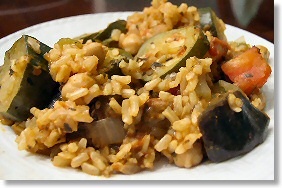 Cover and bake at 375° for 40 minutes or until rice is tender. I have made this several times now. I use smoky paprika and Italian seasoning mix. I also substitute other veggies for the eggplant and fresh tomatoes for the canned but regardless what I do it always comes out tasty and wonderful. This is a standard weeknight meal for my family! I used 2 cans diced tomatoes, drained, and left out the rice. It was delish.